The latest One Piece adventure kicks off with a battle between Fire Fist Ace and the dastardly Blackbeard. Flames collide as these heavyweights lay waste to an entire island. When the dust settles, the scene shifts back to the Straw Hats who find themselves trapped in frigid waters - and hunted by a family of bounty hunters. After their icy adversaries steal the Straw Hats' flag, it's all hands on deck to recover the precious symbol of their pirate pride! Later, while drifting through haunted waters, the Straw Hats encounter a walking, talking skeleton. Luffy quickly befriends the newcomer, but the rest of his mates want nothing to do with this perverted bag of bones. Before the mystery of the seagoing skeleton can be deciphered, the Straw Hats find themselves trapped within the terrifying walls of Thriller Bark! 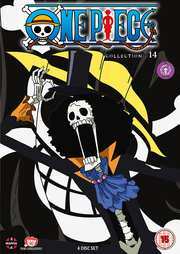 One Piece Collection 14 contains 325-348.